This spring, floral decor is all the rage. But there is a fine line between stylish florals and making your living room look like an old granny. In order to walk that line on the right side of the tracks, I've pulled together five fabulous tips to bringing floral decor into your home. Head on over to Centsational Girl today to read the article! And don't forget to enter the $75 gift card giveaway for outdoor furniture covers and pet car covers! You only have until Saturday night to enter! Love this image. Going to read it now! Puts an instant smile on your face! Holla bringing floral back baby, such an inspirational article, I'm determined to find that perfect bold floral for my home too! So glad Tiffany introduced me to your blog. 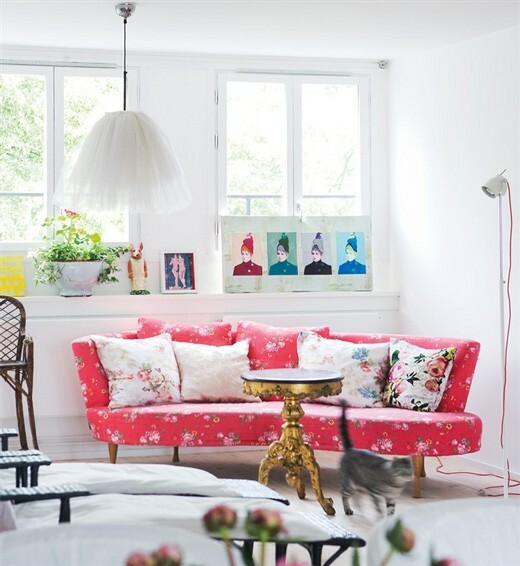 It's adorable and I love this floral couch...subtle yet girly. I would love to do a room like this!